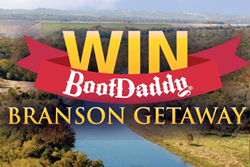 Sign up to win a free three day, two night Branson vacation package with BootDaddy Branson Vacations at BootDaddy.com. PFI Western Store, Home of BootDaddy, invites everyone to bring their family and friends to beautiful Branson, Missouri. Visit “BootDaddy Branson Vacations” to book a fun-filled vacation to Branson that includes shows, attractions and hotel accommodations through BootDaddy’s website http://www.BootDaddy.com. -Two tickets to see The Texas Tenors, at Starlite Theatre, on September 19th. With over 1,000 performances worldwide, The Texas Tenors are three-time Emmy award winners. They combine a unique blend of country, classical, Broadway and current pop music. The Texas Tenors use breathtaking vocals, humor and a touch of cowboy charm to create an unforgettable live show. -Two tickets to see Larry’s Country Diner, featuring Gene Watson, on September 20th at the Starlite Theatre. Larry’s Country Diner is based on his down-home variety show that draws over 1.6 million loyal viewers each month on RFD-TV. The live stage show is careful to retain all of the country charm and entertainment of the televised version. Gene Watson is one of America’s greatest living country vocalists with songs such as "Love in the Hot Afternoon, #1 hit "Fourteen Carat Mind," and his signature song "Farewell Party. -Two tickets to Silver Dollar City. Mid-America's Largest Theme Park, Silver Dollar City has been creating memories for more than 50 years. Set in the historical atmosphere that resembles the Ozarks during the 1880’s, the park offers over 40 rides and attractions including numerous family friendly live shows and demonstrating craftsmen. -Branson hotel accommodations for two nights and round-trip airfare. Don’t miss the chance to win an incredible vacation to Branson, Missouri from PFI Western Store and BootDaddy.com. Contest ends June 10, 2016. PFI Western Store was founded in 1975 in Springfield, Missouri. Since that time, they've expanded to become a leading retailer of Western lifestyle clothing and cowboy boots. PFI stocks over 25,000 pairs of boots in their inventory and has their own BootDaddy brand that includes custom apparel, cowboy boots, perfume, cologne and even BootDaddy moonshine. Shop online at http://www.bootdaddy.com or http://www.pfiwestern.com, or visit the 50,000 square foot store just north of Branson. The Starlite Theatre is Branson’s best place to see live-entertainment and it’s the best place to take your kids for kid-friendly shows. The 880-seat theater in Branson Missouri is conveniently located on historic Highway 76 within walking distance of popular attractions like Hollywood Wax Museum and the Titanic Museum Attraction. It is also a short walk to Howard Johnson’s, Best Western Center Pointe and several other lodging options.